In the world of chicken breast pudding (a traditional Turkish dessert made with thickened milk and thin strands of poached poultry), elasticity is the quality that the confection is judged upon above all else. Tucking into a real tavuk göğsü requires full concentration, a good bit of dexterity and the proper tool. A special spoon with a flat chopping nose – much like a spade – was designed just to deal with the situation and, as far as we know, this utensil is found exclusively in Turkish pudding shops. So when we got a tip from a reader about a muhallebici where “the tavuk göğsü stretches off the spoon much farther than you could fathom,” we knew we’d be dealing with the genuine article. 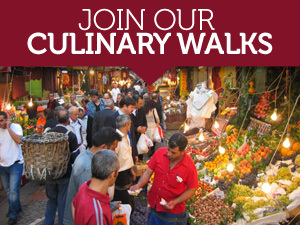 We soon set out for the Kurtuluş neighborhood and Göreme Muhallebicisi, the tipster’s spot, like bloodhounds on the trail. But as we made our way up the area’s Ergenekon Caddesi, we suddenly found ourselves within the cozy fold of this unique district. The pudding shop was our destination but we slowed down and explored the neighborhood’s main commercial drag and its pleasantly straight residential side streets that slope down towards Dolapdere. 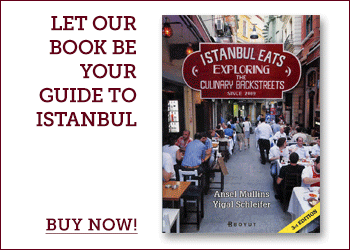 In a city of awe-inspiring vistas, Kurtuluş does not rank very high. Lacking any visual appeal, the neighborhood doesn’t attract much interest from the outside world, which is probably the way locals here like it. “When my grandfather came here in 1950 selling milk door-to-door, the neighborhood was all Rum [the Turkish term for local Greeks] and Armenian,” explained İlhan Yalçın, the current owner and operator of Göreme Muhallebicisi, which opened in 1965. “We still have some customers who remember my grandfather delivering milk to their house, but the younger generations didn’t stay. Too much traffic,” he supposes with a shrug. “Of course, most of the Rum left after the events in 1955,” İlhan quickly added, referring to a violent spasm of looting and destruction in September of that year that targeted local minorities. Mass immigration to Greece following the pogroms effectively brought an end to the Greek community in Istanbul and forever changed the urban fabric of the city. But as much as Kurtuluş society may have changed in the last half century, we could feel the direct lineage to an older and more genteel kind of Istanbul neighborhood life. Outside a jewelry shop, old Istanbul jentilmen in ties and fedoras sat on folding chairs, chatting in the sun. Nearby, a group of intensely coiffed ladies burst out of a flower shop all at once, filling the sidewalk with their bodies and the unmistakable sound of the Turkish spoken by the Rum. 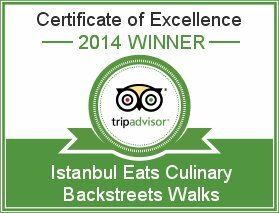 In a rapidly growing and changing Istanbul, this is a neighborhood with an old and healthy soul. It wouldn’t be a stretch to say that a good part of that soul was nurtured on the sublime tavuk göğsü and kazandibi (literally, “bottom of the pot,” a chicken-free milk pudding with a delicious caramelized/burnt bottom) at Göreme. On a recent visit, the small, bright shop was half full on a midweek afternoon. Three or four generations sat comfortably in the same room enjoying a pudding or something else from the short menu that hasn’t changed in half a century. İlhan Bey brought over an order of kazandibi, the pudding spade beside it hinting at the stretchiness beneath the browned skin. It, like the tavuk göğsü, was just as stretchy as promised but also mildly sweet and cool on the teeth. After the shock and awe of the stretchiness wore off, we were left most impressed by the creamy notes of this pudding. Paying the bill, we coaxed İlhan to share his secret. He told us he was just following a simple recipe left to him by his grandfather, in which the most important item is fresh milk delivered daily. That’s it: just follow the recipe, use the freshest ingredients and take no shortcuts. In this city of shopping malls and their food courts, transcontinental metro tunnels and other crazy projects, most Istanbul entrepreneurs have little time for grandfather’s old ways. They’re looking for projects of scale and mass production. Meanwhile, consumers yearn for the previous generation, when true esnaf, or small shopkeepers, dominated the market and played a crucial role in the life of a community. 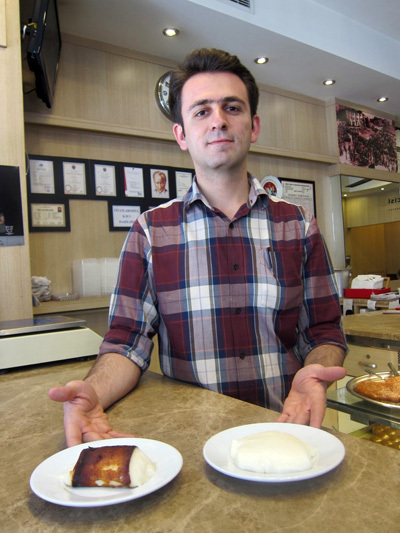 In İlhan’s case, his grandfather shared with him the secret to a good stretchy tavuk göğsü and kazandibi. It’s not flashy, but it turns out to be the recipe for a lasting business model. Thanks for another fascinating review – glimpses of an old world, from a newer one which is itself about to be overtaken as this incredible city continually reinvents itself. Beautifully written as always – I shivered when I read this: “the unmistakable sound of the Turkish spoken by the Rum”. I speak a bit of Turkish and a great deal more of Greek, and I am imagining now how what you describe so evocatively might sound. As ever, a pleasure to read.